They are easily packed and transported, are lightweight and do not easily crumble or fall apart. If they get wet, you can still eat them (promptly) and they are minimally affected by heat or cold. Palatable: They taste good. They are comforting and morale boosting in a bad situation, or a good substitute for candy or cake if you are looking for healthy snacks that won’t derail you’re fitness plan. They are at least enjoyable enough so you won’t cringe at the thought of eating them. Long shelf life. They should last without refrigeration. All of the recipes below are made of long shelf life- ingredients. Chocolate is edible for at least twenty years if stored in a cool, dry place, in a sealed package. It is still safe to eat, but the flavor will not be the best, and it will have white blooms on it. Honey can last about 3000 years, so no worries there. Fresh ground peanut butter and almond butter do not require refrigeration. The only thing to keep in mind is that oils do turn rancid over time, without refrigeration. 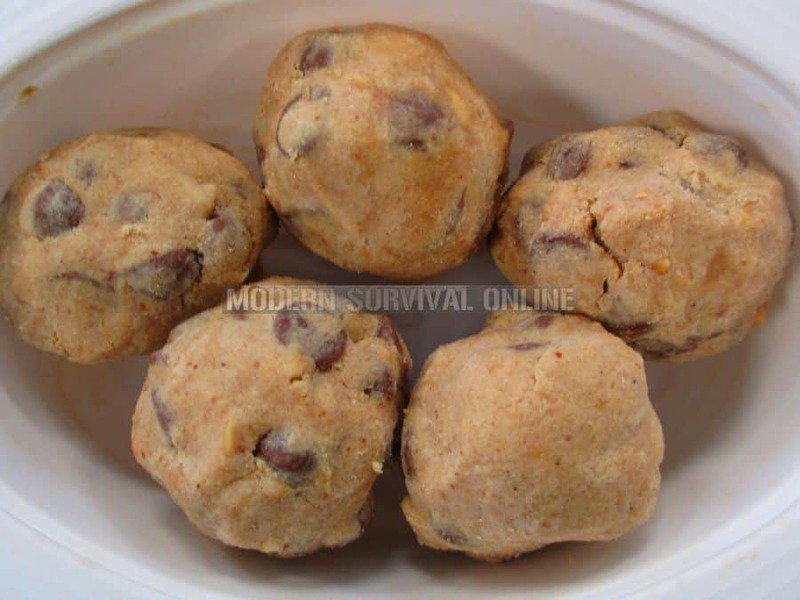 Store some nuggets in the fridge, freeze some, and keep some in your BoB (Bug out Bag). To ensure a fresh supply, engage in the not unpleasant chore of eating them every three or four months, and replenishing the supply from the fridge or freezer. No baking required. 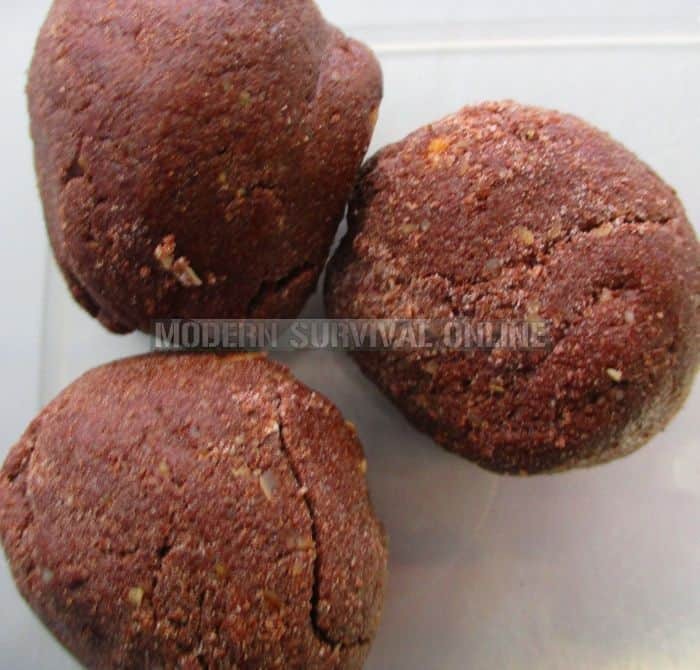 Just mix dry and moist ingredients, roll them in a ball, and coat with indicated ingredients as applicable. Minimal skill required. If you can read and measure and mix ingredients you can prepare these. This simple prep also makes this an idea project for children to participate in, and it is fun for kids to experiment with different ingredient combinations. Teach children to become competent in the kitchen. It is part of being self-sufficient to be able to prepare your own meals, and it is a marketable skill, and one which also lends to social value. I recommend using fresh ground peanut butter or almond butter for the recipes below. Fresh ground nut butters only contain one ingredient: nuts. No hydrogenated oils, no added sodium or sugar, or nasty, Myocardial Infarction inducing trans-fats or high fructose corn syrup, just nuts. I purchase nut butters, fresh ground from local food co-ops. You can also make nut butters yourself in a food processor or blender (you will have to add a little heart healthy oil if you use a blender. Try avocado oil). Sunflower butter or pumpkin seed butters are is a viable substitute if you are allergic to peanuts and tree nuts. Tahini might work, but it would have to be thick. For protein powder, I prefer straight Whey protein; though feel free to try different types. These recipes are not carved in stone, and are amenable to substitutions and tinkering. A good alternative to whey protein is Carnation instant breakfast mix, or malted milk powder, though I find the latter a little too sweet for my taste. You may have to adjust the amount of protein powder depending on the type you use. Add the dry ingredients gradually, until you get the desired texture. Here are six nugget recipes (plus one). Before starting, wash your hands very thoroughly with an antibacterial soap, and make certain your prep area and utensils are immaculate. The fewer bacteria you introduce into the recipes, the longer the nuggets will last. Don’t oil your hands before handling the sticky ingredients, as the added oil will remain on the surface of the nuggets and be one more ingredient which can turn rancid over time. This is a combination of nut butter, which provides protein, protein powder as a binder, for flavor and obviously, more protein, cinnamon for flavor and blood sugar regulation, and chia seeds for fiber, and omega threes. Chia seeds also keep the nuggets from sticking together, and add a nice texture. 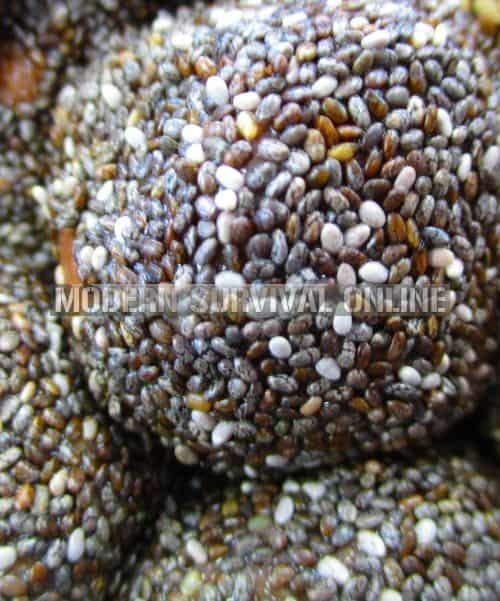 The Chia seeds will soften and burst in your mouth. Preparation: Mix the peanut butter and protein powder together. Fold in the cinnamon, and gradually mix and knead until you reach the consistency of thick cookie dough. 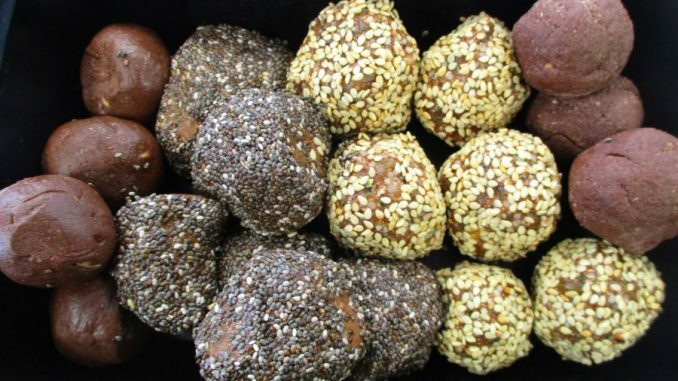 Sprinkle the chia seeds on a plate and roll the balls in the chia seeds or put the balls in a closed container of chia seeds and shake gently until they are coated. Shelf life: These will keep in the fridge indefinitely. All of the ingredients tend to be stable at room temperature. Cold is fine for them, but a hot car on a warm summer day will melt them. They will still be an edible paste if eaten promptly. This is just so good. When you are yearning for a treat and do not want to undo your clean and lean eating plan, reach for one of these. They would also be a reward and real morale booster in an unpleasant situation. Mix protein powder into peanut butter. Fold in chocolate chips and vanilla extract. Mix until you get the consistency of cookie dough, and form into balls. Shelf life: about the same as the chia balls. See above recipe. 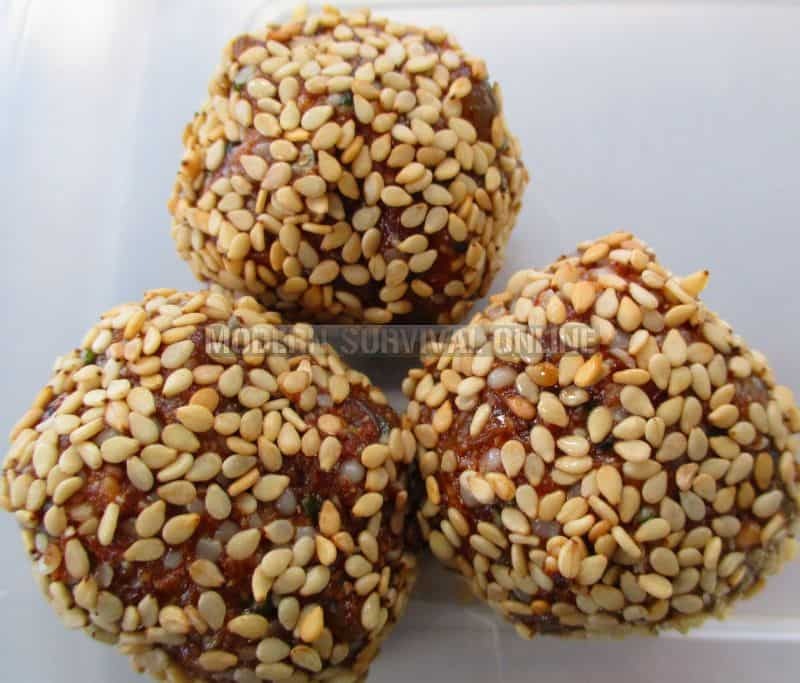 Majoun are Moroccan hash balls. This recipe does not contain any hash or other forms of cannabis. The hemp hearts have a nutty taste, and do not contain any THC, (delta-9 tetra-hydro cannabinol) which is the psychoactive ingredient in cannabis. Hemp hearts do provide heart healthy omega threes, and a touch of authenticity to the recipe. Preparation: Chop the apricots into small pieces. Stir into the almond butter and add the raisins. Add the spices, honey, and orange flavoring. Mix until the consistency of cookie dough is reached. Roll in sesame seeds. Shelf life: These will hold together a little better in the heat. Otherwise, comparable to the above recipes. Does anyone remember Space Food sticks? During the 1960s and 70s Pillsbury made a nutrient dense snack for astronauts, which quickly became popular when marketed to the public. I remember eating the chocolate ones when I was a boy. This recipe is a close copy, as least as far as I can remember. Shape them into balls as they won’t hold together well if shaped into a stick. These taste so good, have a nice chewy texture, and are good for you. Mix the dry ingredients together until you get an even color. Mix the peanut butter and honey together. Combine all and knead until everything is thoroughly mixed. It should be the consistently of thick cookie dough. Pinch off pieces and roll into balls. Shelf life: comparable to above recipes. The D ration bar was a Word War II era emergency food bar. Here is a version of it. The original D ration bars were not intended to taste that good. The theory was that if an emergency ration was made that tasted like candy, it would be eaten before there was an actual emergency, instead of reserved until there was nothing else available. This is probably the least palatable on the list, but it is also the simplest to prepare, with the fewest ingredients, and is very nutritious. More powdered milk for dusting. Mix the dry ingredients together until you get an even color. Mix one part fresh ground peanut butter with four parts of the dry ingredients. Blend and knead until everything is thoroughly mixed. It should be the consistently of thick cookie dough. Pinch off pieces and roll into balls. Roll the balls into powdered milk until they are coated. Shelf life: Comparable to above. 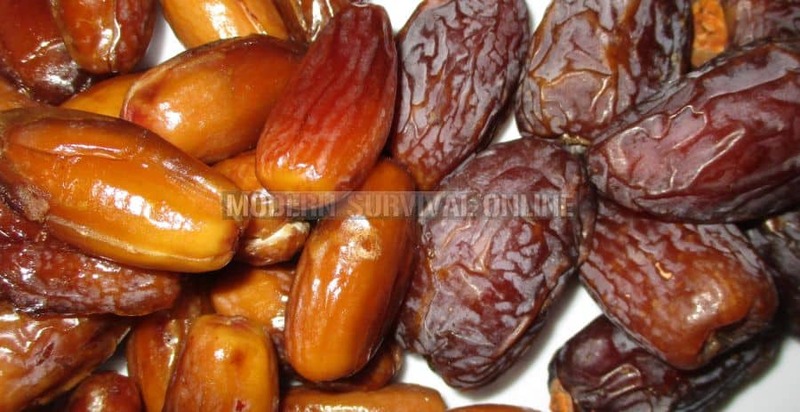 Dates are very nutritious. They do not require refrigeration, they have a shelf life of a year or longer if kept dry, and they are loaded with potassium, calcium, and magnesium, copper, Vitamin A, and B vitamins. They also contain lots of fiber There are about 1.500 varieties of dates, but Deglet Nour, Medjool, and Sukkary dates are my favorite. They are sweet, chewy, firm, and caramel like. Try pitting a date and stuffing it with peanut butter or almond butter, and you have a complete snack. Keep a bag of dates in your BoB, car, office drawer or work locker, and EDC satchel aka Man-Purse.